It’s Megan’s first year at Camp Dakota. There are campers to meet and mysteries to solve. What happened to the cuckoo clock? Why can’t the campers stay on top of the beach ball in the water? How come Megan is taller in the morning than she is at night? Gravity rules in Book #5 of the Summer Camp Science Mysteries Series. 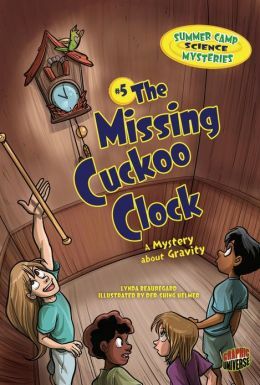 The Missing Cuckoo Clock is a graphic novel that will delight reluctant readers in the second grade level. Multi-cultural campers are depicted in a bold graphic style. The text is entertaining and educational. With more educational material than an average comic book, it will also be appreciated by teachers. The storyline acts as a pegboard on which to hang real-life examples of gravity in action. Blue fact boxes scattered through the cartoon panels offer explanations about how gravity works. Camp Dakota campers watch as lifeguard J.D. demonstrates centre of gravity. They giggle as they try to stand against a wall with heels together and try to pick up a quarter on the floor. They make a gravity clock with water. Each of the mini-experiments found throughout the story can be easily be duplicated by teachers and students. A glossary and gravity fact list are found at the back of the novel. There are also two official experiments for second grade students to perform. In “Uphill Battle”, they can see how gravity makes a round object roll uphill. In “Making a Pendulum”, students test changes in weight and length against the swing rate. This is a fun book liberally sprinkled with serious science!